Miriam inherited her mother's ca. 1940 three-stone diamond and emerald engagement ring. She wanted to reset the emerald as a modern ring she could wear everyday and one day pass it on to her youngest daughter. Miriam lives several hours from Toronto, so visited a jeweller I recommended, Pam Chandler of Artwork Gallery. Miriam liked their clean, modern pieces, and asked Pam for ideas. 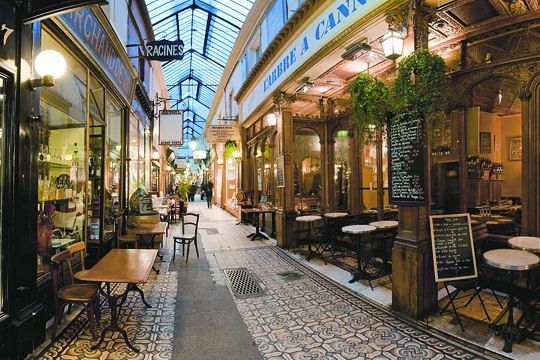 Tip #1: Someone may recommend a jeweller, but it's essential that you like what you see when you visit, which reflects the artist's sensibility. Jewellers design within their style range; avoid one who says he can "make anything". The jeweller made waxes of a three-stone modern band. This is the process for a cast metal setting, and gives the client and idea of scale and shape. Left: The first model was an oval, slightly bombé band with rounded edges. Miriam thought this was not exactly it. Tip #2: If the first try is not your ideal ring, ask for more options. You'll want to be entirely happy and this is the stage to get the shape and scale right. Though some jewellers set their own stones, often a setter handles this work. And at this stage, Miriam got a shock. When he examined the emerald, the setter found it was a doublet, which is a thin layer of emerald glued to another, far less costly substance, in this case, glass. Emeralds, opals, and other gemstones are sometimes made into doublets in order to lower the cost. The process is not considered deceptive if the practice is disclosed. These are not fakes (such as glass or other material sold as an emerald); they are assembled gems. Triplets also exist; in this case an additional clear layer is added to the top of the gem, usually glass or clear quartz. Did Dad know the ring he chose was a doublet? Did Mum? It was treasured—and whether anyone knew is lost to time. The setter would not reset the doublet because of the risk of shattering. Setting an emerald, always an included stone, takes nerves of steel, and a doublet is even more finicky because the emerald layer is thin. Miriam had a choice: take the risk (probably with a different setter), or replace the stone. Pam suggested a green tourmaline, and sent Miriam a shot of it sitting loose in the setting, which was partially completed. Miriam liked this stone. Tip #3: If you are willing to buy another stone, you might take a chance, but I have always respected an expert setter's judgement. There's an axiom that "Any stone can be set; it just depends how", but in this case the setting dictated the stone. Back to gem shopping! Fortunately, Miriam was in the hands of a jeweller with very high standards and superb taste in stones. 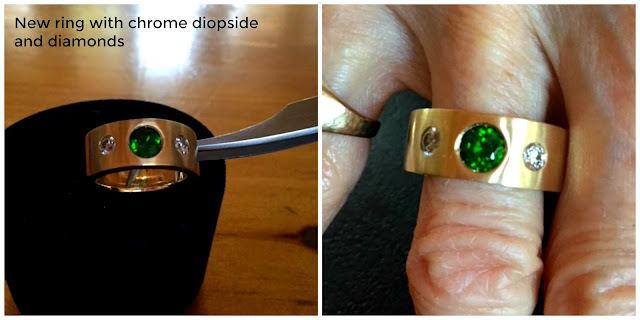 Pam sourced a 5mm chrome diopside, a rich green gem that's slightly softer than tourmaline, but in this protected setting, and with Miriam's loving care, it will be fine. When well-cut, chrome diopside is an exceptionally vivid stone and the colour is natural, never enhanced. 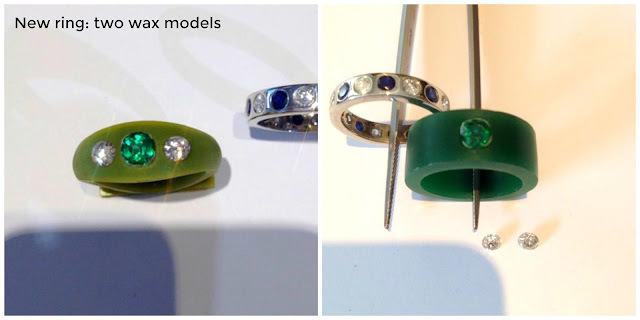 Left: Pam sent Miriam a photo of the finished ring; Miriam had one more trip to make into the city! Right: On Miriam's hand, a beautiful blend of old and new. The ring fits perfectly; the back of the band is slightly flattened to minimize shifting. As Miriam says, her daughter will have the new gem to connect her to her mother, and the diamonds to connect her to her grandmother. Tip #4: Jewellery restyling is both art and science. If the science doesn't line up—the gem isn't what you supposed, or it is weakened by wear or internal flaws—be prepared to look at replacements. Fortunately, in sizes under about 6mm, there are many bewitching coloured gems at very reasonable prices. Miriam was delighted not only with her new ring, but with the process, and that's a credit to her equanimity. 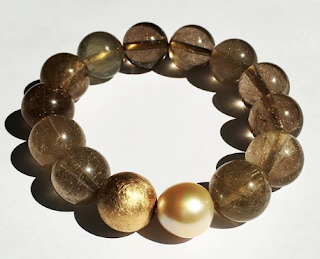 She learned a good deal about gemstones with this project, and took her time to consider her options. Miriam's doublet could still have another life—it's very pretty—as a clasp, pendant or ring that accommodates its true composition. Had she preferred the vintage setting, she may never have known its secret. Now she does, and has a story to tell, as well as a new ring to enjoy. Definition 2.3 comes closest to the gem-related one. I confess to a certain nostalgia for the wartime setting; the one my mother had in wartime Ottawa was more modest still, as they were working in the civil service (my dad had a medical exemption) but guess I watched X Company a bit too closely... Their pay was far from opulent. lagatta: As I remarked to Miriam, perhaps this young man wanted to propose with an emerald, and had a limited budget. If I had to guess, I would say that if he bought it locally, his jeweller would most likely have disclosed the doublet, because jewellers depend on long-term business and an ER is often the first piece of fine jewellery a client buys. Doublets are typically bezel or flush set to hide the "sandwich". Some of the important historical tiaras are stuffed with doublet stones, which was only discovered after technology allowed internal examination without dismantling these pieces. This was really interesting, thank you Duchesse! Loved this post! Fascinating to learn about doublets and about the design / setting process. I didn't realize the setter was so key. And I enjoyed learning more about the various green stones available - never heard of chrome diopside before. And...the historical tiaras....what an amazing tidbit. Thanks to you, Miriam and Pam for sharing this story. This is very educational and a reminder how gratifying it can be to restyle a previous generation's jewels. The gems that are repurposed still carry sentimental value and memories, while new gems make it your own. I liked both waxes, but she chose the one that was right for her. And the beautiful chrome diopside stone, which I have never heard of, really shines. Beautiful! Leslie and LauraH: Most chrome diopside is Siberian and the supply was very limited till about 20 years ago. Sizes larger than 1ct are rare, so chrome diopside is an excellent stone for pieces that do not require big stones. They glow, like emeralds. But (and there is always a trade-off in the coloured gem world) they are quite soft. 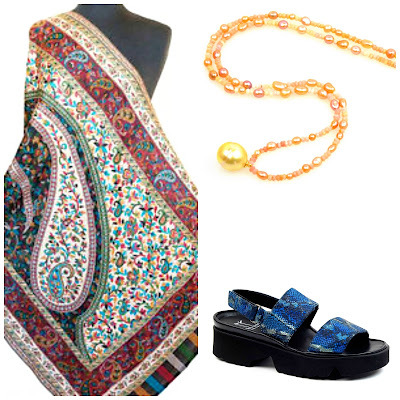 Not as delicate as opal, but they do not take daily wear happily. OTOH they are not pricey so you could replace them. I had a pair of earrings set with them and wore them for over 20 years before giving to a friend. Oh dear, I'm afraid I love the original, vintage ring. I'm looking at a ring on my hand right now of that vintage. It is all about the stones. The setting is very minimalist, thin band and prongs. Jane: It just depends on the style a woman likes. I have no concerns about restyling a vintage ring, with only one major caveat: if it is a signed piece by a renowned maker, I'd rather not see it done. Nethertheless some women, like my friend B., pull apart a gorgeous vintage Cartier sapphire ring and have something else made. If someone doesthat, I'd be sure the setting was left intact in case you'd want it put back one day. But for most pieces, the key criterion is "What will I wear every day with pleasure?" I have also seen some gawdawful restyling- naturally I don't post those. Jane, I trust you're having those prongs checked regularly to assure that your beautiful stones stay securely set. Thank you, Duchesse, that was fascinating. I liked the old setting too. I have a 21st birthday diamond and emerald ring that was made from one of a pair of earrings paid to my great-great grandfather as a legal fee during the Civil War. Obviously it means a lot to me-- but when I had it appraised for insurance purposes the jeweler said it was so weakened by being worn as a ring for so many years (it was a 21st birthday gift to my mother too) that I shouldn't wear it any more. I am Miriam's youngest daughter and just saw her ring for the first time in your blog, without knowing the back-story...wow what a turn of events discovering the doublet and having to re-think the design and central stone! It is bold and contemporary and will be cherished. It is reminiscent of my own wedding ring, designed by a jeweller in Wakefield, QC, which is a wide 6 mm concave gold band with a textured water-like pattern. 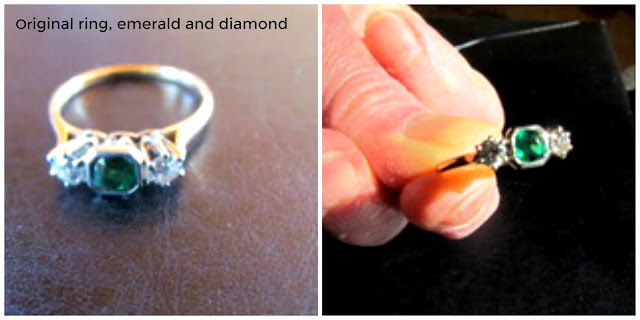 A green solitary 3 mm diamond is inset into it.